On the back cover of the CD, Bourke gets a most flattering endorsement from his former teacher Frankie Gavin, who does not hesitate to call him "one of, if not the finest soloist performing Irish traditional music on fiddle today"--does this mean Gavin is no longer playing? 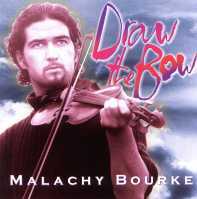 Bourke is indeed a fine player, and the fact that he performs at a very steady pace and with virtually no accompaniment (there is some bodhran, at times a bit too trebly, on some of the tracks) gives the listener a perfect opportunity to savor his intricate ornamentations, bow work and variations. Many of the tunes are well-known, exceptions including two acrobatic hornpipes once recorded by James Morrison, and one hornpipe composed by Frankie Gavin. According to the notes, Bourke plays a fiddle which once belonged to the great Paddy Killoran, and performs a set of reels beginning with "The Silver Spire" as a tribute to the master. Bourke also uses a viola on one medley of reels, "Julia Delaney's & Spike Island Lassies."